The reader of Dream of Ding Village is constantly reminded of various classic tales: the post-apocalyptic feel of Camus’ The Plague; the Darwinist horror of Golding’s Lord of the Flies; the “some animals are more equal than others” turn of events at the school, reminiscent of Orwell’s Animal Farm. The more the story progresses though, the more it appears like a biblical reckoning, a plague sent to punish the greedy and inconsiderate. In a society where people only care for themselves, there is nobody (except Grandpa Ding) who bothers to think about what tomorrow may bring. Possibly… It’s a good book, but I’m not sure it’s good enough to be one of the main contenders. The translation was alright, but nothing special – the dialogue, especially, was a little stilted at times, a problem which often arises when the very different Asian forms of address are put into English. It will depend a lot on the books I haven’t read yet, so if I like a lot of the others, this is one which will probably miss the cut. Again, possibly. Most of what I’ve heard from other people has been positive, and I have a feeling that people would like to see a non-European book on the shortlist. I think this may be one which will be mid-table and pushing for that final spot on the list. Hi Tony, nice review, broadly agree – you're not going to ICELAND, are you?! I think your review is spot on, Tony. I thought it was an interesting book, but I had similar reservations about the sometimes clunky translation and the story itself. So far I've only read Asian contenders for the IFFP but even so it worries me a little that there may be a hidden agenda to award the prize outside Europe to provide 'balance' rather than judge the books on their merits. For me, it's not about gender, origin, the political message or worthiness of the issue in the book, whose 'turn it is' or anything else, it's always about the book! The comparison to Camus certainly makes it sound intriguing but I'm not sure when I will read this. Wait till you get to Hate, A Romance for strange translation! (I'll be taking it back to the CC Library early next week, I've almost finished it now. not read this yet, but it is one I'm interested in, if you're going to Iceland, hope you enjoy it as much as I did. Good review Tony … though I do wonder how easy it is to comment on the quality of the translation when you don't know the original. How can you tell whether the problems you see are in the translation? The one thing that bothers me about reviewing translated books is this whole issue … not only am I reading a book through my own interpretation/view of the world, but through another's interpretation of that book in the first place. I was a bit mystified about the use of italics. I wonder what they signified? whisperinggums – I think it's often easier to tell a poor translation than a good one (although I've just read a couple of excellent ones!). Basically, if you find yourself struggling with clumsy syntax and awkward word choice, there's a fair chance that the translator hasn't done a great job. Some people who know actually say that part of Murakami's appeal in the English-speaking world is the great job Rubin and Gabriel have done with the translations! I just finished this and found it rather harrowing, but a beautifully-written book. I did have a slight problem with some of the translation (dad and kids annoyed me), but I was willing to overlook that because the story is so important. The scandal of entire villages decimated by AIDS in Henen Province due to mercenary and unhygienic blood collecting practices is so utterly appalling. The fact that the Chinese government banned the book and tried to hush-up the whole thing makes me feel very angry. 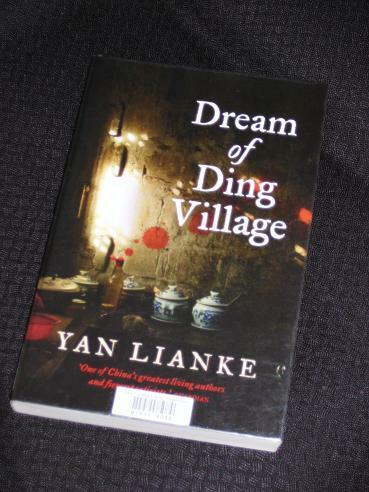 I would like to see the book win the IFFP, because Yan Lianke was extremely brave to tell the story. Again, this is where our views differ. It's a horrible piece of history, and it's great that the truth (or this version of it…) is getting out, but this is a prize for the best book, and I don't thing 'Dream of Ding Village' is anywhere near that.